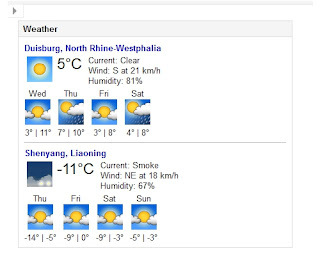 The picture shows the difference in temperature between the town I lived before in Germany and the town I´m living now. Local time here in Shenyang was 10.30 am when this screenshot was taken. Makes 3.30 am in Germany. About ten days ago snow fell for the first time this.... well, it`s not even winter yet, so this fall, and temperatures dropped below zero during daytime. That`s about one month earlier than I´m used to, but we knew before that winter in Shenyang was supposed to start early.It did. I realized that especially Shenyang car owners didn`t seem to care as I haven`t seen a single car with snow tires yet. Although I must admit at least the streets get cleared pretty quickly here, they even use heavy machinery like power shovels, which imho is pretty rare as you seldom see big machines on construction sites in China - with it`s huge workforce here it`s often cheaper to use manual laborers. But not for removing snow from the streets,no. For clearing the sidewalks of course. They: "It´s like that every winter. It snows, and the traffic gets jammed immediately. Me: "Do you have special tires for winter here?" Me: "Do you have to use them?" They: "Yes, you are obliged to use them". But very,very few people do that." Me: "I guess there are no controls by the police? And no fines?" Me: "Does this car have snow tires?" Me: "Will you get tires this winter?" Well, I missed an appointment but learned about Chinese mentality - and like most things, also not caring about winter having started can have a good side. One day later I was strolling through a park to take some pictures when I encountered this group of dancers. Dancing couples in a park are quite common in China, but those people here had to clear loads of snow before having enough space for their pirouettes. Ratatouille - "delicious food total mobilization"
The Incredibles - "super humans total mobilization"
Finding Nemo - "seafloor total mobilization"
I´m wondering - is this coincidence? Was the same person responsible for the translation of all the three movies? Was this person just not that creative or has a military background? Or is this an attempt of subconsciously influencing little children to later join the Chinese army? Or is the similarity in the titles just for ensuring good feng shui on your DVD shelf? Last week we went out with about a dozen of my girlfirend`s Chinese co-workers for dinner and karaoke. The latter will be a story for itself here anytime soon, today it`s all about the advantages of eating out with locals. Firstly, of course, there`s the opportunity to train your language skills - although Chinese working for international companies are able to speak English (and some even German) more or less fluently, with a ratio of two Germans to a dozen Chinese eventually a lot of Chinese was spoken and had to (at least tried to) be understood. Or not. Anyway, secondly, there`s the chance to try dishes you so far didn`t know of, couldn`t read on the menu, that didn`t look appealing or until then you did not dare to order. But the Chinese do. In China, when it comes to eating animals, there are no boundaries like "too cute" or "too disgusting" that would hinder them to increase their menu variety. Personally, I find that very consistent - once you`ve decided for yourself that eating animals is o.k., be it as an individual or a society, why not eat all of them. Although when going out by ourselves we mostly stick with our western socialization of ordering beef, chicken, pork, sometimes fish. In bigger restaurants like the one we went with our Chinese friends it is often usual that the big variety of seafood is displayed in big basins to choose from. And honestly, who of us would have ordered those little fellas in the middle of the lowermost row in the picture on the right? (click on pictures to enlarge them) Well, I wouldn`t, besides the fact that apart from being displayed in Chinese restaurants I haven`t seen them anywhere else before. But they definitely look like they`re called in Chinese - 海肠 (hǎicháng), the word-by-word translation would be "sea intestines" or "sea sausage", as the character 肠 (cháng) can mean both, intestines or sausage. Yeah, let`s you sometimes think twice before ordering something having this character in it`s name. For the fellas on the picture in my opinion "intestines" fits better. For increased disgust imagine them moving like worms, as that`s what they did in this basket. Aus einem chinesischen Buch für PRAXISORIENTIERTE deutsche Grammatik. Man beachte die Beispielsätze Nr.2 und 5. What do you mean, no STAFF over the trolley? Am I supposed to carry those guys around?